Home invasions have been an ever lasting problem society has faced over the course of time. Protection against home invasion means being prepared to not only make vital life saving decisions, but to prepare and train for such incidents. Pistols are the most common choice of handguns that buyers consider when it comes to protection in the event of a home break in. Although some experts deem revolvers as a better choice for home security; pistols are more commonly used due to the fact they offer faster reload times, along with magazines that hold more ammo. Comfort is the key when choosing the right pistol for the job. 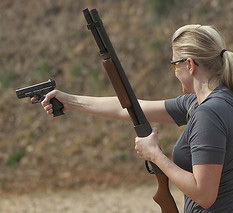 What might be a better pistol grip for a larger male may not be comfortable for a smaller sized hand on a female. If you are unsure about which might be best for you, a local gun shop owner can give a demonstration on the difference between high, center, and low pistol grips to determine which type is the most comfortable before choosing the right pistol. Below is a list of what we consider to be the five best home defense pistols and a brief overview of their capabilities. With a little bit of research and some common sense we've put together a list o the best 5 home defense handguns as of 2012. Guns listed below, and while not everyone will agree 100% the data will at the least give you a great starting point. One of the oldest and most recognized handguns in the world is the Colt 1911. This pistol has seen action as a military sidearm in multiple wars dating back to the First World War all the way up to Vietnam Era and is still commonly used by government branches such as the FBI. The Taurus PT1911 .45 ACP semi-automatic pistol comes with an 8 round steel single-column magazine, and has been heralded by gun enthusiasts as a favorite choice right out of the box. The Glock 21 is a semi-automatic pistol with the capability for fast reloads. The reason why Glocks are a top choice for home defense is they are a time tested pistol that has been proven to be a simple pistol to reload, along with a safety built into the trigger for easy access. Glocks are less likely to jam than some other brands. The .45 ACP has the ability to hold up to 13 rounds. For enthusiasts who have some extra money to spend on a pistol, Kimber offers a line of Colt 1911 series that can fit the specifications one seeks. The Eclipse Target II Series comes with a stainless steel frame, and a 30 line per inch checkered handle to ensure a stable pistol grip even under less than desirable circumstances. It comes with an 8 round .45 ACP, full sized frame that allows for accurate shooting, and adjustable day-night sights. The Ruger SR9c is a 9mm Luger that comes with a 10 round mag and an extended 17 round magazine to provide full pistol grip. This pistol is smaller than other high caliber pistols which are normally recommended for home defense, but it can hold more ammo in addition to having a more pleasing grip for smaller sized hands. The Smith & Wesson Home defense kit is hybrid all in one gun/home defense kit designed for the needs casual and skilled gun owners alike. The SD40 Pistol comes with two 14 round magazines, an easy to use safe, and a tactical light mount that weighs 1.4 ounces with the power to obscure the vision of anyone who faces it. Thanks to drjimiglide for use of the photo.